Contemporary shower doors in exclusive designs in clear and frosted glass. These frameless shower doors are made in 8mm and 10mm toughened glass in pivot, saloon and sliding door designs. We also of bespoke shower doors made to our clients specific dimensions to special order. A luxury frameless shower door manufactured in the UK in 10mm safety glass. Each frameless door has smooth action hinges which are solid brass with a chrome finish. A quality addition to design led bathrooms. A British designed and manufactured shower door that is made in luxury 10mm safety glass. 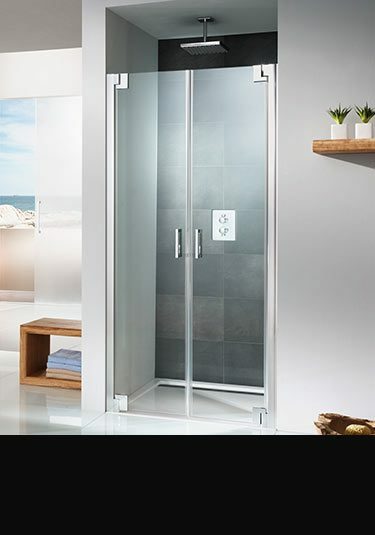 This designer shower door is frameless in styling and is ideal for showers and steam rooms as well as an entrance door to a bathroom or ensuite. This superb quality frameless shower door has a fixed glass side panel which embellishes the contemporary styling. Each frameless door is made in market leading 10mm glass which really adds to the luxury quality. A surface mounted glass door that easily slides on a chrome minimalist slide rail. Each sliding door is made of 8mm safety glass which has an easy clean glass treatment. 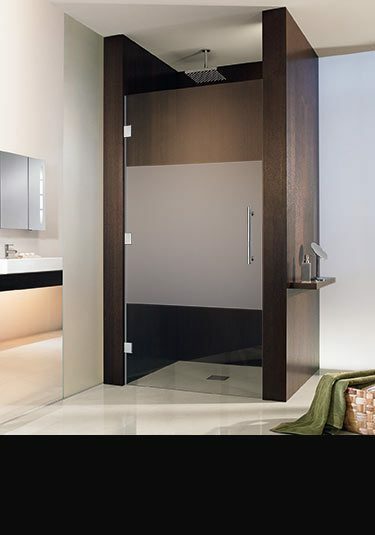 Ideal as a contemporary enterance door for bathrooms, shower rooms and ensuites. Supplied with life time guarantee. A high quality glass sliding door that slides invisibly in the the wall. 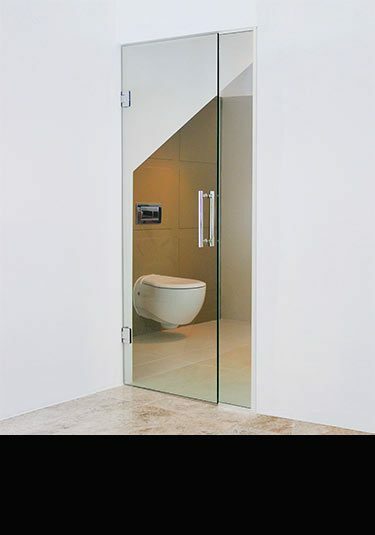 This in-wall door is available in four 10mm glass finishes and is ideal as a bathroom and larger shower room glass door. A frameless shower door with a frosted privacy strip. This frosted door is made of 10mm safety glass which is the thickest glass available. Available in 4 shower door sizes which are supplied with a lifetime guarantee. 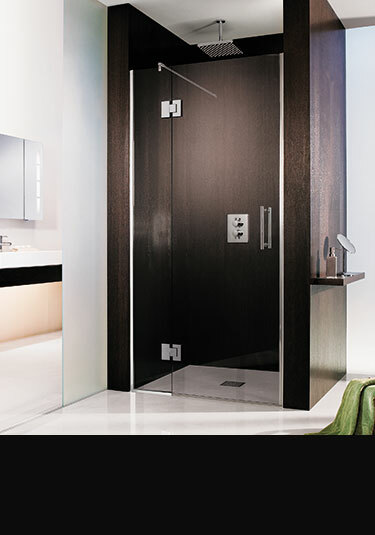 A smooth running British made shower door manufactured in superior 10mm safety glass. This sliding door partition is frameless in design and is a high quality luxury addition to designer bathrooms. Impressive German quality shower door with rising hinges, ensuring a smooth opening action. 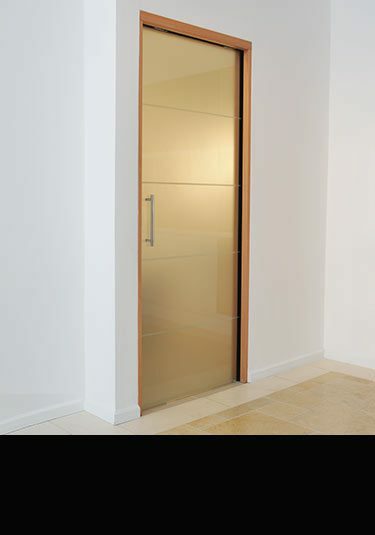 This frameless door is made in 8mm glass which has an anti calcuim coating for reduced and easier glass cleaning. Lovely quality shower doors with rising hinges that open both inwards and outwards. These salon shower doors are made in Europe in 8mm safety glass, which has an easy clean coating for lower maintenance. The saloon doors have smooth action hinges made of solid brass with a chrome finish. We also supply Uber modern frameless shower doors, glass sliding pocket doors, frameless frosted shower doors, Toledo frameless shower doors and the highly popular saloon shower doors which opens both inwards and outwards. There are rising hinges that combine signature German technique in the assembly allowing smooth operation. Many glass panels used in these showers have an anti-calcium coating for easy and spotless cleaning. 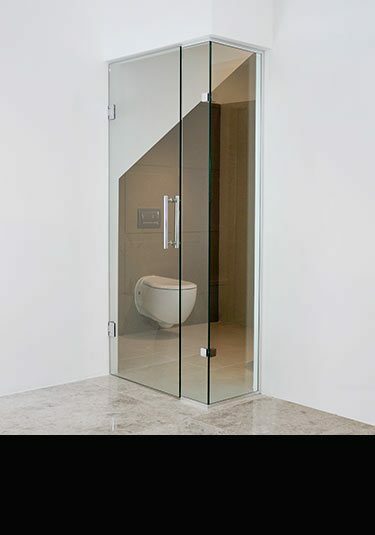 Furthermore, the glass sliding pocket bathroom door that we supply is a unique design as this sliding door is installed within the wall and slides invisibly away. So it is an idea design fixture for bathrooms, as well as for steam rooms and shower rooms. 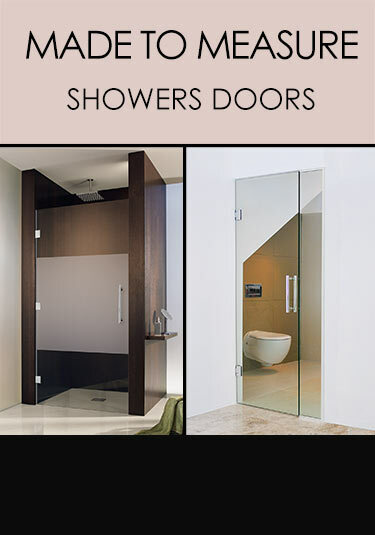 Please browse through to know more about the wide range of frameless luxury shower doors that we offer.